Yogurt – any kind of yogurt you prefer. I use a mixture of full fat Turkish yogurt and regular yogurt. Chop your onions finely, add the chopped onions together with the salca and black pepper to the meat mixture and kneed everything well with your hands. Set aside. Put all the ingredients for the dough into a bowl and kneed for a about 5 minutes. 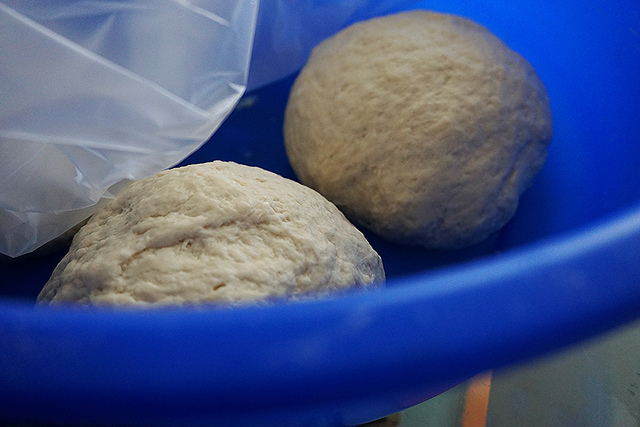 The dough should be slightly tougher than regular bread dough. 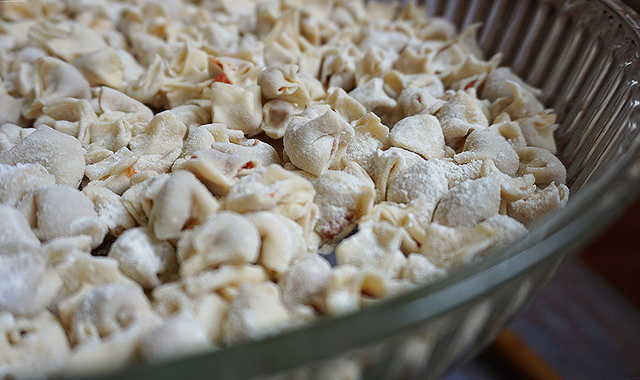 Divide your dough in parts depending on how large your working surface is. 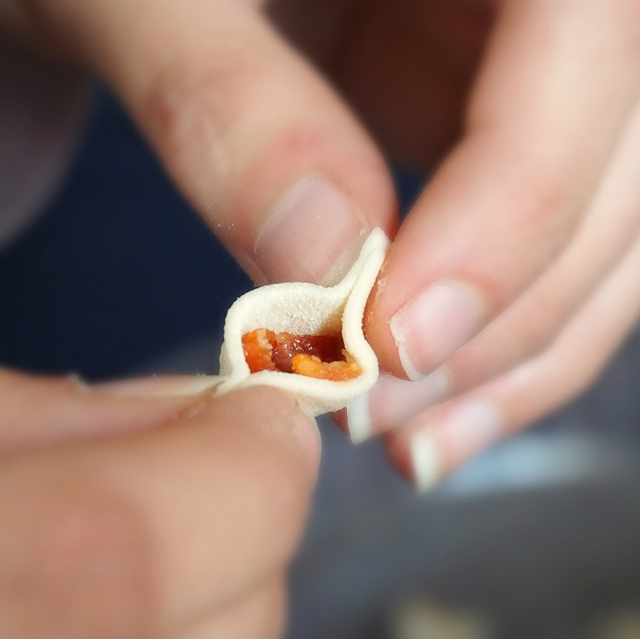 Take one of your dough balls and roll it out thinly. 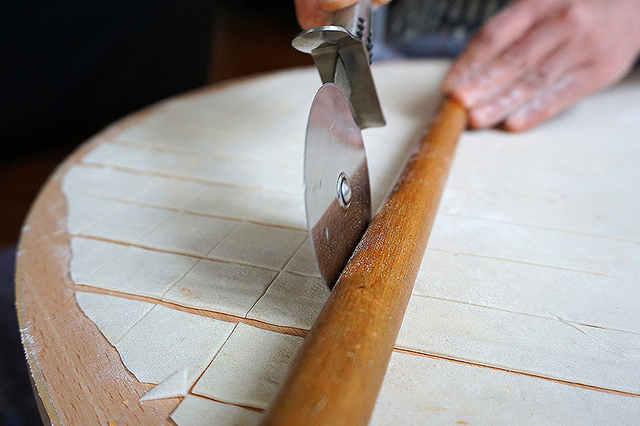 The dough should be around 1-2 mm thick. 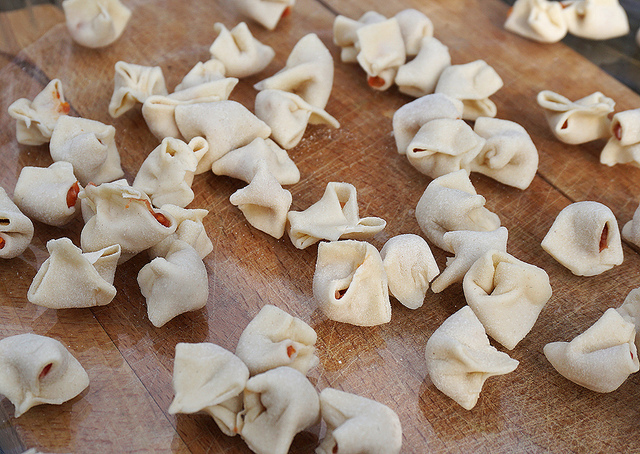 Take a knife and start cutting little cubes out of your dough. I use a pizza knife and a rolling pin to get even cubes. 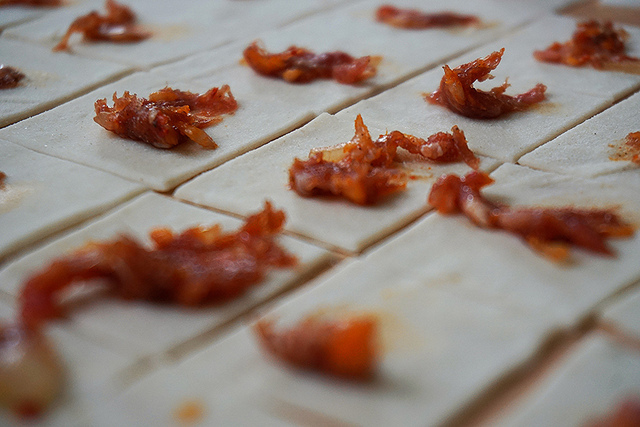 Spread out your meat mixture onto the dough cubes. Keep in mind that you need to boil these and that if you fill them up too much, the mantis will pop open in the water. 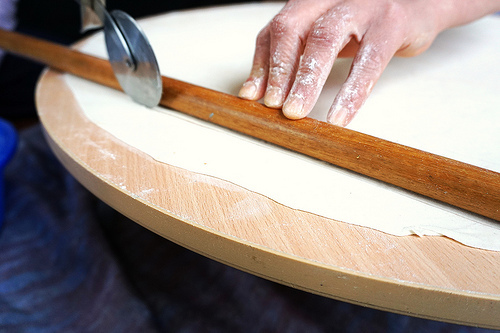 Now comes the most time consuming part of making manti, you have to close each manti one by one with your hands. While you continue making the rest of your mantis, spread (don’t stack them up too much!) the already made mantis onto a large tray and dust with flour. Store in the fridge or freezer! 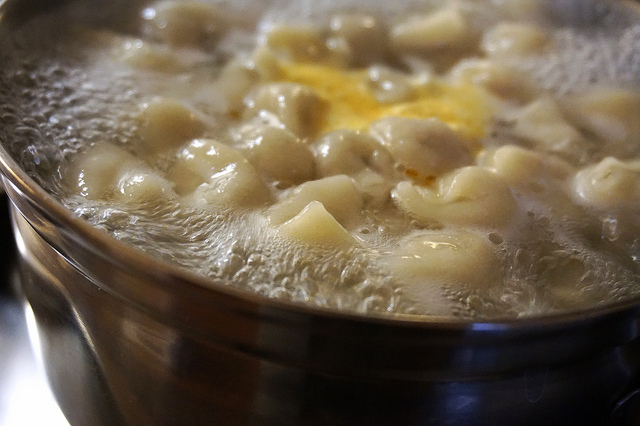 This is especially important if you arent going to boil them right away or if you are planning on freezing them. If you want to freeze your mantis, you can put them in ziplock bags after theyve chilled in the freezer for a few hours. Meanwhile you can continue making the sauce for the mantis. 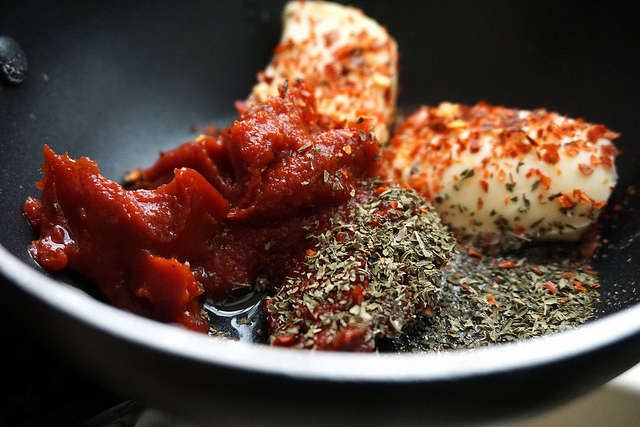 Put all the ingredients for the sauce in a saucepan and cook for about 2-3 minutes. 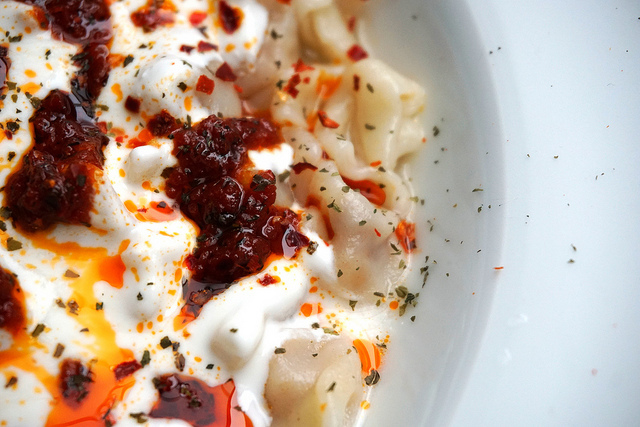 Scoop some yogurt and sauce on your manti, some extra spices if you like and enjoy. :)!